I ran long today. It was HOT. And sometimes after a long run you crave CARBS. So, tonight, I decided to trick my body into thinking that I in fact did have carbs! I found the original recipe on PalOMG which is a GREAT site with so many wonderful recipes! However, I didn’t have all of the ingredients, so I kind of made it my own. I would check out the original recipe though – especially if you like onions and if you have fresh basil. I didn’t have either, so I compromised and worked with what I had. I also made enough sauce for just little ol’ me, so if you want more, then double the recipe. You can add chicken or turkey to this for protein! Below is a way to cook spaghetti squash in the oven, but I actually prefer the microwave because it’s quicker. Google it, and you can find step by step instructions on how to do it! Also – take liberties with your spices. I always guesstimate on how much I’m really putting in, and sometimes you need a little more zing or zest – so make sure to taste test and see if you need to add anything. 1 tsp rosemary – I didn’t have basil, so I used rosemary, but dried basil would be great too I think! And so would a handful of fresh basil! Cut spaghetti squash in half, lengthwise, and remove the excess seeds and strings. Place open side down on a baking sheet and cook for 20-25 minutes or until spaghetti squash is soft when you push the skin or the threads easily come out when you take a fork to it. 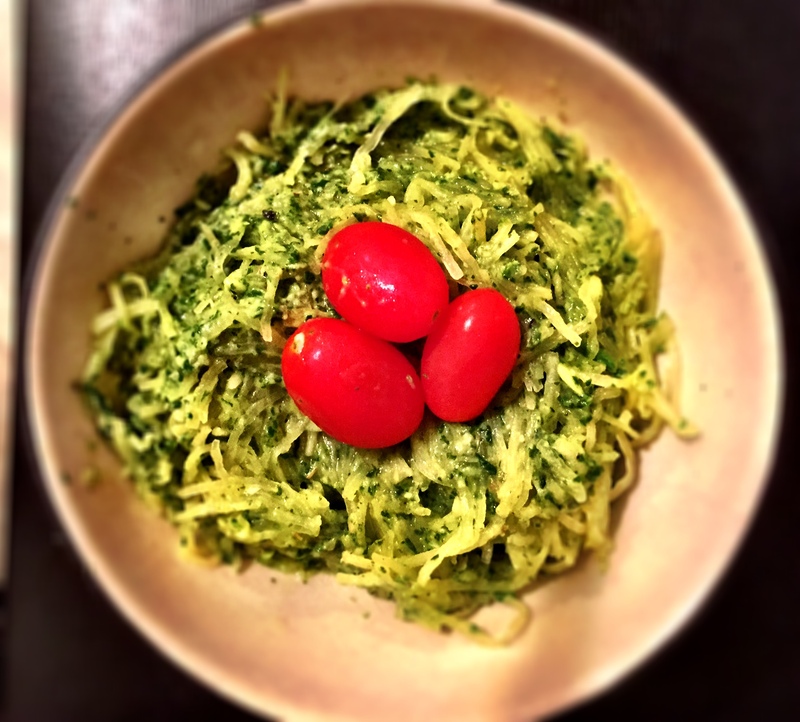 While your spaghetti squash cooks, place a tablespoon of olive oil in a medium saucepan over medium heat. Add 3 garlic cloves to your hot pan and then toss in your spinach. Let your spinach wilt down, then add it to your food processor. Then add the parsley, thyme, salt, rosemary and pepper. Add the avocado to your food processor along with your lemon, anything else to taste. Puree until smooth, then add your 2 tablespoons of your leftover olive oil. Once your spaghetti squash is done cooking and cooled, dethread your spaghetti squash and place threads in a large bowl. I only used half for this recipe and put the rest in the fridge for tomorrow! Mix thoroughly and top with cherry tomatoes. Eat it like you mean it!